If you have arrived from Julie's blog you are on the right track. If not, you can follow the list at the bottom of the post to start at the beginning. For this project I decided to use the Eve, a Modern Woman stencil as my inspiration starting point. Here are some process photos of how my painting came to live. The finished piece is 12" x 17". 1. Stenciled Eve face stencil onto book paper and painted in loosely. 2. Painted the background of the canvas and stenciled Andrea's Precocious Peony stencil randomly around the edges. 3. Cut face out of book paper and applied to the canvas with Golden Matte Medium. 4. Used the It's All in Your Headdress Stencil with Wood Icing sold by StencilGirl to give some dimension to the piece. 5. After Wood Icing dried. Then came my favorite part. The details. Pens, markers, gold paint.....did I mention this is my FAVORITE part? I had so much fun using these stencils! 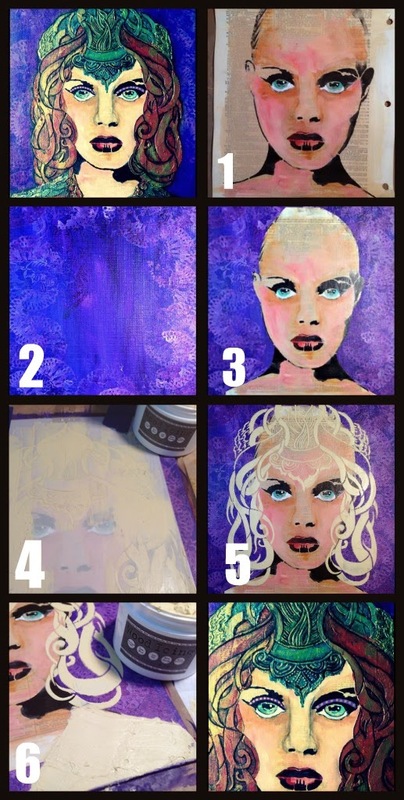 Thanks Andrea for a inspiring and beautiful collection for StencilGirl! 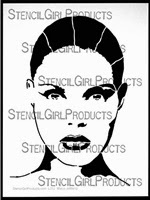 Before you go, make sure you leave a comment to be entered into one of the 2 giveaways on StencilGirl Talk. 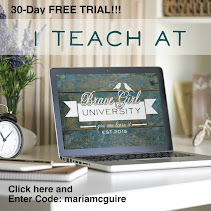 All comments on all blogs are eligible! Giveaway closes on Sunday, April 6th @ 11:59PM Central Time. Gorgeous piece, such a lovely 'headdress' with the wood icing! I love her magnificence, power and strength. Thank you for sharing your method with us, I love it. Such intricate details and pretty colors!! Absolutely faboulous! Love the design, the colours, the texture ... I haven't heard of wood icing before, have to check this out (but I'm not sure I can get it here in Sweden). Thanks for the inspiration! Loving these face stencils! Great work, gorgeous piece. Love seeing your process and such a great result. She is ready to rule the world!! wow, your combination of stencils is great. This looks like a lot of fun. Now I want to play, too! She is absolutely gorgeous! Love it! Wow, Maria! This is absolutely GORGEOUS!! Love how you layered the stencils and added in tons of details! The face stencil is great. A must have. Have to admit this face is one of my favourites. I see her as a warrior out of a Game of Thrones! This is beautiful, Maria! Gotta love that wood icing!! Love the deep rich colors. Love the texture and the depth! I love this face stencil! Beautiful job on this face, Maria. Striking colors and amazing job on her face details. Your piece has so much dimension and the end result has a nice richness to it. Thanks for sharing your process. Fabulous Maria! That wood icing sounds like so much fun! I'll have to bring some home with me when I get down there for our retreat!!! beautiful. love the depth from the wood icing. you completely brought her to life. Gorgeous! Love the wood icing with the headdress, looks fantastic! Thank you Maria! This is so sculptural...looks great. Wow! What a Beautiful piece of art! You really showed those stencil off wonderfully! 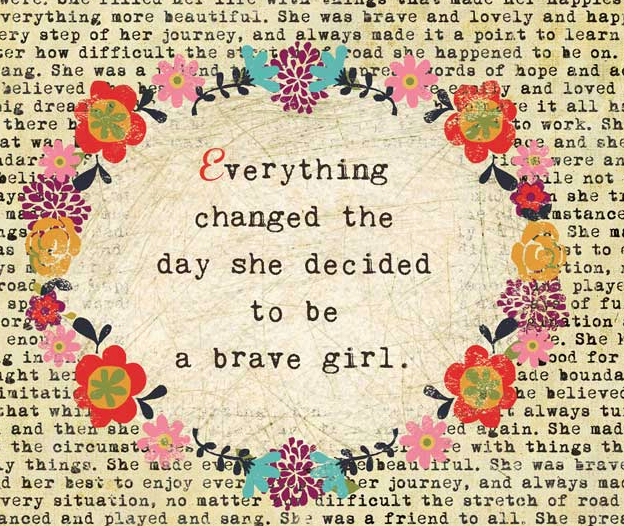 Ohhhh, I really like this. You did a beautiful job. Thank you for sharing your talent with us on this Hop. Love her eyes and her mouth! Love the layering of stencils ! Ohhhhhhhhhh love that face stencil! GREAT idea for her hair! I've never been able to sketch faces! I'm drooling for some face stencils. Stunning!!! This took my breath when I clicked on your site. It is just stunning. Using wood icing for the headress and the shirt added interesting dimension, and your painting with some of the fine details you added really set it off and pulled everything together. Wow, I just can't say enough good things. I like this so much. Congratulations and thanks for the inspiration. Holy Wood Icing, Batman!!! This is stunning!! The colors are so rich... just lovely. Maria, it looks like you had so much fun playing with Andrea's stencils. The colors are beautiful. Everyone on the hop created such fantabulastic art. I am so glad I didn't miss anyone. Cannot wait to play with Andrea's stencils too. What a beautiful piece of art. Wonderful stencils. Wow, I loved what you did with this stencil, especially the texture. Well Maria, you did a beautiful job! Don't you just love that headdress stencil? I think is's just so cool! Thanks for all the ideas and inspiration - this blog hope makes me want to stay up and play - but I can't, I will wait until tomorrow. I have been waiting very impatiently for Andreas stencils to show up and oh my! She does not disappoint, does she? Thanks again! OMGOSH!!! LOVE IT! Want to touch it sooo bad! Wow .... yet another unique way to use the stencil. Love the idea of doing it on paper then collage. Also loved the head piece. Really, really want to win these stencils to play too!! I am amazed at the wonderful work everyone is creating with Andrea's stencils... Bravo! She really is stunning! So regal and warrior-like. I really love the Eve stencil. Wow! What a gorgeous painting! Thanks for the opportunity! The wood icing and your painting bring these stencils to life!! Marie, love the stencil and the brilliant colors! Maria this is AMAZING! I loved seeing each and every stage of how your beautiful creation came to be! Wow, such a lovely piece. Beautiful colours. 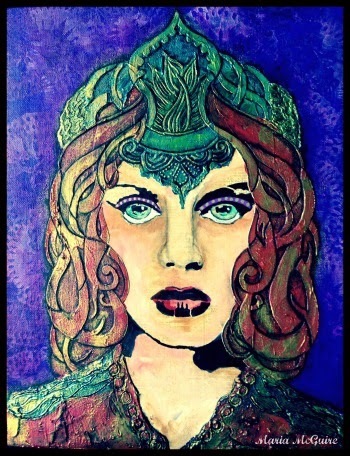 Amazing how you've brought this stencil to life.....love the green eyes! Love your Regal use of my favorite stencil - it looks amazing! Wow. Stunning work and I love the stencils. Okay, I am loving this. I love this stencil. I am so excited about what you did with it. I have been wanting to buy the Wood Icing for a while and just wasn't sure what it was all about. Seeing what you did with it. WOW! I have to buy some...stat. Thank you for using it and for sharing such a beautiful finished design. Glad I found your blog.